The Bolingbrook Babbler: Manchester Mumbler: No space aliens in the UK says UKIP! 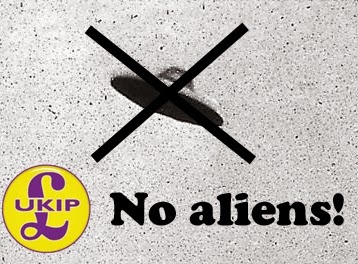 Manchester Mumbler: No space aliens in the UK says UKIP! Note: Due to legal issues in the United Kingdom, our sister publication, The Manchester Mumbler was not allowed to run this article. We are posting this article on our web page in solidarity with our sister publication. Most spellings have been Americanized. Sources within the United Kingdom Independence Party say if elected, they will evict all space aliens. The sources agree that if the party gains control of the House of Commons in 2015, their first act will be to shutdown all 20 UFO bases, and evict all 1000 resident space aliens from the country. Critics of UKIP charge that such an eviction would cost the UK an estimated £100 trillion, destroy the UK’s covert science foundations, drive the UK into the dark ages, and incur the wrath of the New World Order. Og Pgod, spokesperson for the Resident Interstellar Society of the UK, denounced the UKIP’s alleged policy. No one from the UKIP would publicly comment to The Mumbler.